Get the look you have always wanted with ear piercing services at Uptown Spa in Toronto. If you wish to bedazzle your ears with diamonds for a special occasion or if you prefer the hip, urban look, our professional ear-piercing specialists can help you achieve the appearance you desire. Using sterile techniques and modern equipment, our experienced professionals can pierce your ears safely. Piercings can be one of the best ways to make a bold fashion statement without saying a word, and you can get your ears pierced in our comfortable spa oasis. There are many different types of piercings for body modification, with pierced ears remaining the most popular. Most people get their ear lobes pierced, but some opt for ear cartilage piercing higher up, and some get double or multiple piercings to achieve the bold look they desire. An ear piercing diagram can help you determine the location you prefer, including lobe, upper or transversal lobe, conch, helix, industrial, rook, daith, tragus, ragnar, snug, and more. Both women and men choose ear piercings, and some parents opt to have their children’s or baby’s ears pierced. Types of piercings vary, but your Uptown Spa professionals can help you select suitable options for the look that is best for you and let you know of any age restrictions or health restrictions that might affect you. We charge one flat-rate cost to have both ears pierced at the spa. Ear piercing can be somewhat painful, but our professional equipment and expert techniques help minimize your discomfort during this quick procedure. After piercing your ears, our professionals can give you advice on ear care, including how to clean your pierced ears to prevent them becoming infected. With proper care and simple precautions, your pierced ears can remain beautiful and healthy throughout your lifetime. To pierce your ears, you will need to select earrings that suit your style. Uptown Spa offers a wide selection of ear studs for your first piercing, along with beautiful earrings and other jewelry to help you change your look for special occasions. Pierced ears can allow you to make a statement and display your personal style, matching your outfit or your personality on any given day. The professionals at Uptown Spa can help you pick out the appropriate earring type for you with the colour and style that match your unique personality. 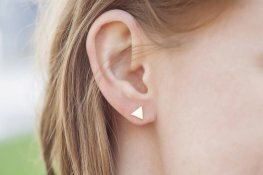 Where do I find an ear piercing place near me? If you are looking for where in Toronto to get your ears pierced, visit Uptown Spa at 801 York Mills Road in North York, Ontario, Canada, between Don Mills Road and Leslie Street. Our clients travel from downtown Toronto and all across the greater Toronto area to find the best place to get ear piercing. Book an ear piercing appointment online or phone us for more information about our services including ear piercing prices. Our busy spa cannot guarantee walk-in appointments will be available, so call now to schedule your ear piercing. Your dazzling new look awaits.